Bird flight cages can help the bird in captivity retain some of the behavior she displays in the wild, all the while keeping her safe from the watchful eye of the family cat. Flight cages can cost upwards of hundreds of dollars, but with a few hours to spare, the right kind of wire and a little patience, it's possible to construct your own. 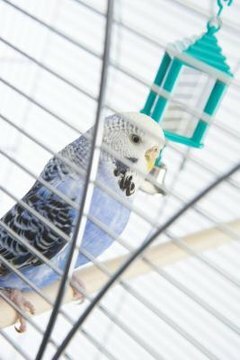 Determine the size of the cage based on the size of your bird, her wingspan and the size of the space you can afford to the flight cage. Using the wire cutters, cut the panels accordingly. For a cage 4 feet tall, by 2 feet wide, cut the panels 4 by 2 feet for the sides. You'll need four. Cut two panels 2 by 2 feet for the top and bottom. File all rough edges to avoid potential injury to your bird. Stand one panel upright, and attach the second using the electrical ties. Repeat for the remaining sides. The ties should be no more than 2 to 3 inches apart to make certain the cage is secure. Add the bottom of the cage and secure with electrical ties. Carefully lay the cage on its side or flip it upside down, and secure the top. Cut a small opening for the entryway. A 5-by-5-inch square should be sufficient. File any rough edges. To fashion a door, cut a slightly larger square from scrap wire, remove any rough edges and attach the door with electrical ties. Secure the door closed with an S hook or small tension spring.  A second bottom on the cage will allow you to slide in a tray for easy cleanup. ⚠ Keep scissors and wire cutters away from children. ⚠ Trim all electrical ties as short as possible to keep your bird from dining on the excess plastic.